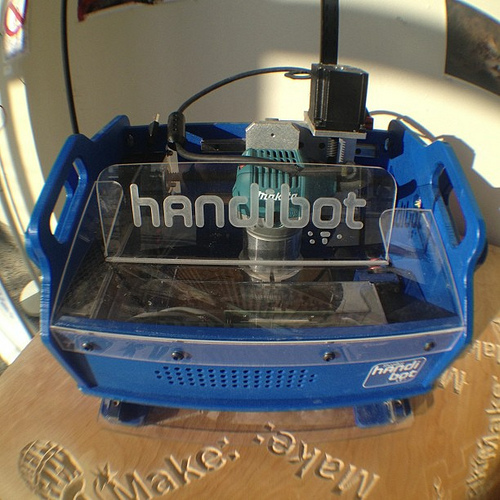 The new Handibot, from ShopBot Tools. A major manufacturer of CNC routers today launched what it hopes will be “a whole new class of digital tool” called the Handibot. The announcement was made at the Hardware Innovation Workshop, underway in San Mateo, Calif.
ShopBot CEO Ted Hall introduces the Handibot at Wednesday’s Hardware Innovation Workshop. It will be available in June. ShopBot Tools, based in Durham, N.C., has been demonstrating the compact machine at HIW. It can perform precision cutting, drilling, machining, and carving, just like a standard CNC router, but it’s compact and mobile, and it can work with an evolving library of task-oriented apps. The ShopBot team shows off the CNC guts of the Handibot to an enthusiastic crowd. One of the unsung heroes of the “new industrial revolution,” the CNC (computer numerical control) router combines agile cutting power with computer-controlled, robotic smarts. ShopBot Tools, which has lowered the price for an entry-level CNC router to around $5,000, is responsible for seeding workshops around the world with nearly 6,000 CNC routers. ShopBot’s Handibot will be initially priced at $2,500, but the company is hoping that the price will float down over the next few years. A crowdfunding campaign for the first batch of Handibots is targeted for June, with the first deliveries a few months after that. The major advance of the Handibot, Hall said, is that it will enable users to take CNC-style precision cutting “to the material” — to construction sites, for example. To encourage innovative contributions, ShopBot’s software system for running applications on the tools will be open source; so will the hardware. The Handibot has a lot of impressive features, but Hall is hoping that by launching into a sea of makers, this new tool — possibly the first of an entirely new class of tools — will develop in ways that its inventors never imagined. How would you use the Handibot?